When mounted on a series of tripods and connected to a photocell, the Model 35575 Bassin Anticipation Timer is modified for a more complex task. The goal is to time the approach of the light with the swing of a bat so that the infrared beam is broken at the same time that the light reaches the end of the runway. This unit could be applicable for a bat swing, tennis swing, or even a soccer kick. The control box displays in milliseconds, the amount of time that the swing or kick was too early or too late. For more information about the Model 35575 Bassin Anticipation Timer, view RELATED PRODUCTS. 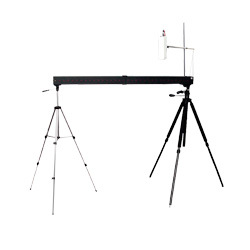 Tripod for mounting Infrared Control or Modified Bassin Timer. Replacement hardware and cables for Modified Bassin Timer. Tripod Stand used as part of our Modified Bassin Timer System.